In Lizartza, the Mayor visits city hall just once a week. In fact, Regina Otaola doesn't even live in the northern Spanish town over which she presides, nor does she speak the native language of most of its inhabitants. She claims to want nothing more than to function "like a normal mayor," meeting with citizens, scheduling street repairs and planning town festivals. But the armed bodyguards required to shield her from potential attacks reflect the perils of being a pro-Madrid mayor in this stronghold of Basque nationalism. 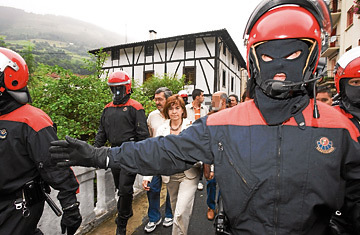 Despite its idyllic setting in a quiet valley just south of San Sebastián, Lizartza has been seething since May, when Otaola of the conservative Popular Party was elected mayor despite winning only 27 of 355 votes cast  a feat achieved only because the Spanish authorities barred candidates of the Basque Nationalist Action party (ANV), judging them to have been "contaminated" by links with the Batasuna party, outlawed by the government in 2002 on the grounds that it was the political arm of the terrorist group ETA. "They outlawed our party and brought in an outsider to be our mayor," complains O., a young bartender who asks to remain anonymous. Such sentiments are common in Lizartza, as is graffiti accusing Otaola of being a "fascist" and demanding amnesty for ETA prisoners. But the mayor remains undeterred in her efforts to impose her pro-Spain beliefs on a separatist-minded community. Indeed, candidates supporting independence for the Basque country have won all but one election in Lizartza since the reestablishment of democracy following the death of the dictator Francisco Franco in 1975. In May, 186 votes went to the ANV and a further 142 ballots were left blank in protest at its disqualification. But the weakness of her mandate has not humbled the mayor. "If you believe in your principles, you have to act on them," says Otaola, 55. Upon taking office she hung the Spanish flag inside the town hall, removed photos of jailed ETA members, and demanded that all official meetings be conducted in Spanish rather than Basque. When ANV members slipped into the building to hold a press conference, she ordered the locks changed. In response to what she considered ceaseless disruptions and insults  including the new locks being plugged with silicone  she closed town hall meetings to the public. Convinced that many of Lizartza's citizens are afraid to speak their minds, Otaola sees herself bringing "democracy and freedom" to a town long controlled by radical nationalists. "Sometimes it feels like I'm in one of those westerns," she says, "where the whole town lives in fear until a new sheriff comes to town." The High Noon stance is misplaced, says ANV secretary general Antxon G�mez, describing Otaola's image of herself as "planting the Spanish flag and fighting off the savages." Sitting at a local restaurant, G�mez and three of the party's disqualified candidates are livid about Otaola's mayorship. "When she comes to town, the police stop all cars and block cell phone transmission," says Consuelo Agirrebarrena. But what most troubles these ANV activists is the law that allowed her to come to power at all. "There's a difference between legality and legitimacy," says G�mez. "For 22,000 people in the Basque Country, people with no criminal charges against them, to be barred from running for office for being 'contaminated,' is not only demented but undemocratic." Lizartza's hostile standoff echoes the broader political stalemate in the Basque country. Hopes were raised in 2006 for an end to the nearly 40-year-old conflict that has claimed more than 800 lives, when ETA announced a cease-fire and the Socialist government of Prime Minister José Luis Rodríguez Zapatero gingerly signaled a willingness to negotiate. But the talks collapsed when an ETA bomb killed two at Madrid's Barajas airport on Dec. 30. By the time ETA officially ended its cease-fire eight days after the May elections, mistrust between the two sides ran deep. And the opposition Popular Party has exploited the failure of the talks, repeatedly attacking Zapatero for "negotiating with terrorists." With Spain's general elections seven months away, stances are hardening. Still, Otaola hopes that hers won't be the only non-nationalist party on the town's slate when her four-year term ends. Agirrebarrena and her fellow ANV members dismiss that as folly: "She's not going to persuade anyone. The town just wants her to leave." Freshly painted graffiti on the town hall building urges her to do just that. Every Monday, Otaola has it removed. Every Friday, it reappears.